Scheduling jobs on unrelated parallel machines so as to minimize the makespan is one of the basic, well-studied problems in the area of machine scheduling. In the first part of the paper we prove that the power of preemption, i.e., the ratio between the makespan of an optimal nonpreemptive and an optimal preemptive schedule, is exactly 4. This result is a definite answer to an important basic open problem in scheduling. The proof of the lower bound is based on a clever iterative construction while the rounding technique we use to prove the upper bound is an adaptation of Shmoys and Tardos’ rounding for the generalized assignment problem. In the second part of the paper we apply this adaptation to the more general setting in which orders, consisting of several jobs, have to be processed on unrelated parallel machines so as to minimize the sum of weighted completion times of the orders. 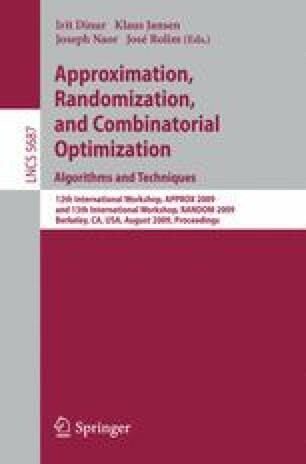 We obtain the first constant factor approximation algorithms for the preemptive and nonpreemptive case, improving and extending a recent result by Leung et. al. This work was partially supported by Berlin Mathematical School, by DFG research center Matheon in Berlin, by CONICYT, through grants FONDECYT 1060035 and Anillo en Redes ACT08. The authors thank Nikhil Bansal for stimulating discussions on the material in Section .